]UAE, June 25, 2014[– Soichi Noguchi and Andrew Turnage, senior officials from the Association of Space Explorers (ASE), an international nonprofit professional and educational organization of over 395 astronauts and cosmonauts from 35 nations, recently visited the Emirates Institution for Advanced Science and Technology (EIAST). During their visit, Noguchi, an astronaut and Turnage, who is currently ASE’s Executive Director for USA Chapter, were given a tour of the facility and briefed on the recent initiatives and projects undertaken by EIAST, including DubaiSat 1, recently launched DubaiSat 2 and KhalifaSat – 100 per cent Emirati-built satellite to be launched in 2017. A Japanese aeronautical engineer and a JAXA astronaut, Soichi Noguchi’s most recent space visit was in 2009-2010 as part of the Soyuz TMA-17 crew and Expedition 22 with the International Space Station. 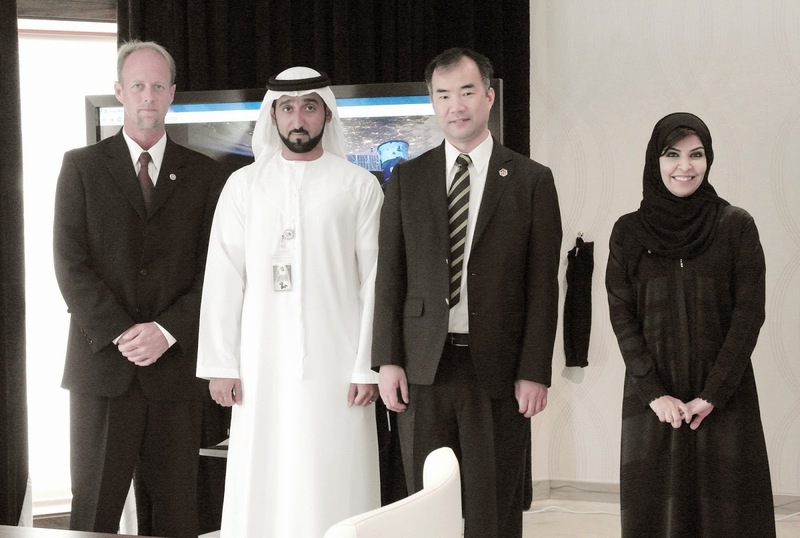 Soichi Noguchi and Andrew Turnage were in the UAE on a goodwill visit. A Japanese aeronautical engineer and a JAXA astronaut, Soichi Noguchi’s most recent space visit was in 2009-2010 as part of the Soyuz TMA-17 crew and Expedition 22 with the International Space Station. Andrew Turnage has been the Executive Director of the ASE – USA and is responsible for the direction, development and operation of the US chapter. Ministry of Education opens doors for its employees to complete their postgraduate studies at the University of Dubai. [UAE, June 25, 2014] – The Ministry of Education has signed a partnership agreement with the University of Dubai to grant the ministry’s employees a 20 per cent discount on tuition if they take up programs, including postgraduate studies, at the academic institution. The MoU was signed by H.E. Marwan Al Sawalih, Undersecretary of the Ministry of Education, and H.E. Dr Issa Al-Bastaki, President of the University of Dubai, at the ministry’s office yesterday morning (Tuesday, June 24, 2014). The agreement is part of the ministry’s policy to form strategic partnerships with relevant institutions. Ministry of Education UAE and University of Dubai. Under the terms of agreement, the University of Dubai will provide the ministry a range of educational services in the areas of undergraduate and postgraduate, professional training and academic development, as well as software packages related to technical and operational projects. The university will also provide research and consultations with regard to conferences, forums, and workshops in which both ministry and university officials can participate in. The MoU came at a time when the ministry is preparing for the school holidays, giving the employees more time to complete their postgraduate studies either in the country or overseas. The ministry’s partnerships with prestigious universities such as the University of Dubai will further encourage its staff to pursue higher studies given the discounted tuition. H.E. Al Sawalih said employees may choose from several relevant programs and disciplines available in the university based on their interest and current job requirements. He highly praised the University of Dubai for its significant contributions to the education sector, specifically for honing the knowledge and skills of the UAE residents. For his part, Dr. Al-Bastaki lauded the Ministry of Education for its efforts to continuously raise the bar in the education sector and further enhance the quality of the services in the industry. He said the MoU between the ministry and the university is the first step towards a more fruitful cooperation in the future. Dr. Al-Bastaki said the ministry’s employees could choose from the university’s several world-class programs and utilize the school’s state-of-the-art facilities to aid in their studies. The MoU signing was attended by a number of officials from the ministry and the university. EIAST welcomes visit of high level delegation from Kazakhstan. ]UAE, June 9, 2014[– The Emirates Institution for Advanced Science and Technology (EIAST) recently hosted the visit of a high level Kazakhstan delegation headed by His Excellency (H.E.) Kairat Lama Sharif, Ambassador Extraordinary and Plenipotentiary of the Republic of Kazakhstan to the United Arab Emirates (UAE). The visit falls in line with the move to bolster mutual cooperation between EIAST and Kazakhstan’s National Space Agency (KazCosmos), particularly in the field of exploration and use of outer space for peaceful purposes. The group was met by EIAST’s top officials headed by H.E. Yousuf Al Shaibani, Director General, EIASTand Eng. Salem Al Marri, Assistant Director General for Scientific and Technical Affairs. 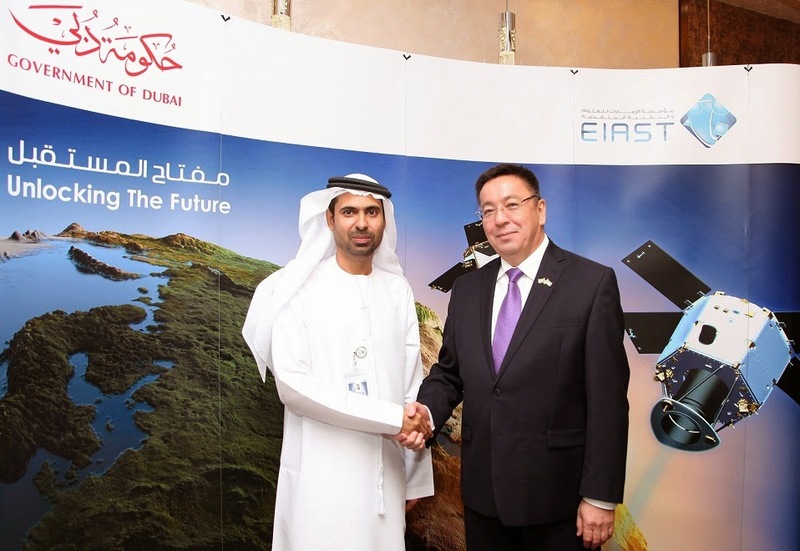 During their visit, the Kazakhstan delegation was briefed on EIAST’s recent achievements like the successful launching of DubaiSat-1, the first remote sensing satellite to be fully owned by a UAE entity, in 2009 and DubaiSat-2, an electro-optical earth observation satellite system, in 2013. The group was also able to learn about the current status of the KhalifaSat project, the UAE’s first locally-built satellite that is expected to be launched into space in 2017. Currently, a team of Emirati experts and engineers are involved in the planning and designing of KhalifaSat, which will help strengthen the standing of the Arab region in the competitive field of space science. The delegation was also toured around EIAST’s key facilities, which includes the ground station of DubaiSat-1 and DubaiSat-2 satellites, which provide high-quality satellite images for environmental projects, urban planning, infrastructure and scientific research in the UAE. In response to their visit to the EIAST, the Kazakhstan delegation expressed interest in continuously working together with the UAE in the fields of satellite communication and earth remote sensing. The group thanked the EIAST’s warm reception and reaffirmed their commitment to establish cooperation in key areas such as space science, global satellite navigation and use of space infrastructure. Ambassador Sharif was joined by Yerzhan Kalekenov, Minister-Counselor of the Embassy of the Republic of Kazakhstan in Abu Dhabi; Alibek Almabekov, Counselor of the Consulate General of the Republic of Kazakhstan in Dubai and Ibrahim Aushev, Diplomatic Attaché of the Embassy of the Republic of Kazakhstan in Abu Dhabi. Mutual cooperation covers areas of remote sensing applications, space communications, and global navigation systems using satellites. ]UAE, May 26, 2014[– In line with the common aspirations to position Dubai as a premier Smart City, the Emirates Institution for Advanced Science and Technology (EIAST) has signed a memorandum of understanding (MoU) with Dubai Municipality to facilitate knowledge transfer, sharing of data and practical experiences, and developing human resources in the areas of space science, remote sensing applications, space communications, and navigation systems using global satellites. The MoU was signed by Eng. Abdullah Mohammed Rafi, Deputy General Manager of Engineering & Planning, Dubai Municipality and Salem Humaid Al Marri, Assistant Director General for Scientific and Technical Affairs, EIAST, in the presence of a number of senior managers and officials from both parties. H.E. Yousuf Al Shaibani, Director General, EIAST, stressed the importance of building a fruitful cooperation with Dubai Municipality, meeting the highest scientific and technical competence standards. This is in support of the UAE’s vision to transform itself into a major hub for satellite manufacturing. He emphasized EIAST’s commitment to prioritize the future needs of Dubai Municipality in terms of developing engineering designs for satellites such as satellite images applications to contribute to the efforts of achieving comprehensive and sustainable development. Eng. Abdullah Mohammed Rafi, Deputy General Manager of Engineering & Planning, Dubai Municipality and Salem Humaid Al Marri, Assistant Director General for Scientific and Technical Affairs, EIAST. For his part, Rafi stressed that Dubai Municipality is keen on establishing strong cooperation and strategic inter-dependence with institutions and groups of public welfare and community services. The commitment demonstrates Dubai Municipality’s efforts to develop and create effective, easy-to-use, smart services for the community. 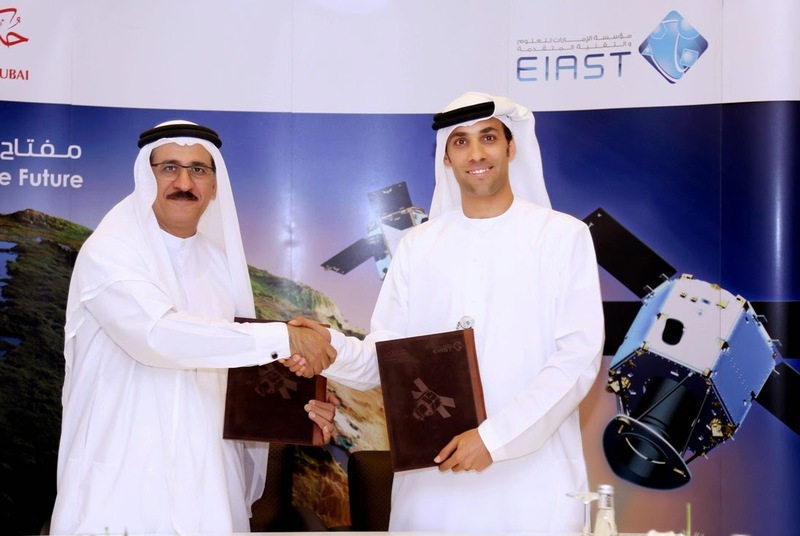 Under the MoU, EIAST will provide Dubai Municipality with multispectral space images satellite and high quality Panchromatic images of Dubai. Dubai Municipality, on the other hand, will provide Ground Control Points, spatial and geographic data to support the projects and initiatives of EIAST. The MoU also provided a platform to promote prospects for cooperation between the two parties through exchange of practical experiences and development of human resources in the areas of space and science, including space science, remote sensing applications, space communications and global navigation systems using satellites. Both sides agreed that EIAST would help Dubai Municipality to complete the database information of the geographic information system. It would also assist in enhancing the efficiency of monitoring and prediction of natural hazards such as sand storm forecasting, monitoring and forecasting of fog, analyzing water quality in the Emirate of Dubai. EIAST will provide services to help train the staff of Dubai Municipality and refine their skills and technical capabilities through cooperation in the areas of research, training and exchange of information and knowledge as well as organizing conferences, workshops and shows related to applications of satellite imagery in remote sensing area and in the field of geographic information systems. The two parties will also cooperate in all areas, activities and systems to share data to serve the public interest in Dubai. The two parties agreed to form a joint working group to oversee the implementation of the MoU and ensure the exchange of data between them. 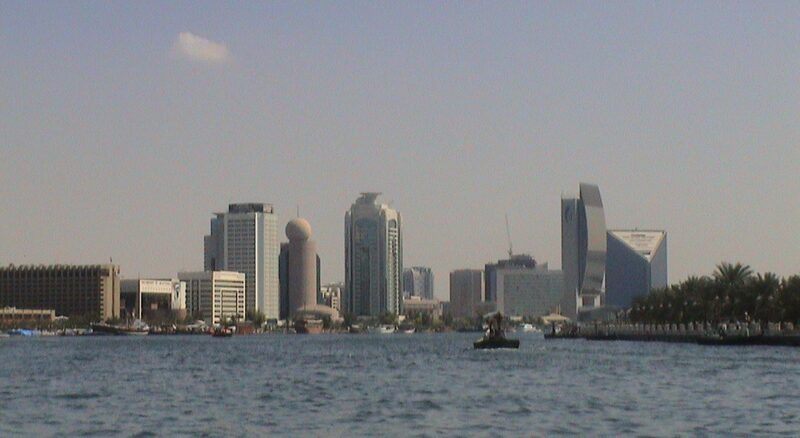 They are also discussing the possibility of allowing Dubai Municipality’s various departments to use satellite images. The departments include Environmental Management, Survey Department, Department of Agriculture, and others. The joint working group will also discuss the possibility of technical cooperation between the two parties so that EIAST could take into account the needs of the Municipality when designing the specifications of future satellites as well as when studying the programs and available tools. These tools may be effective and useful in terms of utilizing geographic information systems and remote sensing. The working group will also ensure that the two parties will obtain the required data to face future challenges and to allow them to perform any task that may be assigned by either party and is required to implement the MoU.